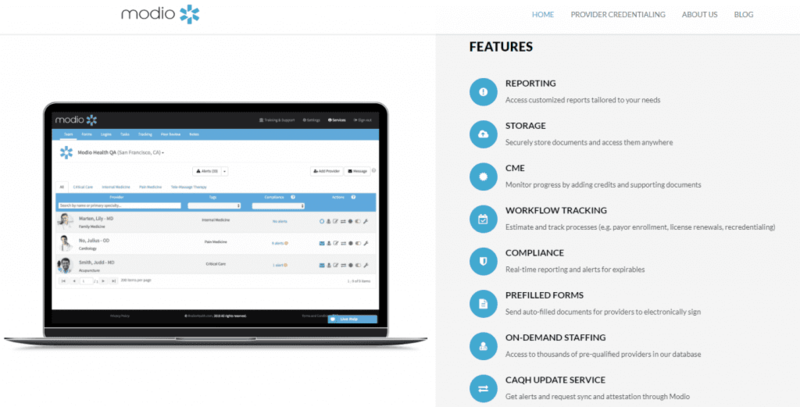 What is Credentialing Management Software? Credentialing software is used for organizations to store, track, and update the necessary credentials and certifications of its members. In many cases the process of tracking all necessary credentials is tedious and time consuming. While this need is most common with medical credentialing for healthcare providers and other medical professionals, companies in many industries such as law enforcement, financial, manufacturing, construction, and more are required to track credentials. This type of software platform is designed not only to store employee credentials, but also set reminders to automatically notify when renewals are necessary, and some providers even suggest other courses to take for continuous learning. If you currently manage this process using Excel spreadsheets, Word documents, or even a simple filing cabinet with paper, you know how complex it can be. We suggest looking at credentialing software to save your department lots of time, and more reliably make sure you are following all of the necessary requirements. By having individual profiles for each employee, managers are able to quickly verify the level of training a team member has completed – even allowing individual members to log in to their own profile to see if there are any outstanding courses to take or certifications to update. Credentialing software can also be used to handle any vendor requirements, not just internal staff. With online software, it is easier for vendors who are on site or off to log in, verify they have the necessary credentials, and proceed with their job. If medical credentialing software seems like a good fit for you, or credentialing management software in general, read on to see the top 10 credentialing management software products out in the market in 2019. Modio Health has credentialing software that was developed by physicians and credentialing experts. It is meant to automate the healthcare credentialing process so your physicians and other professionals can focus on patient care. The platform is very intuitive and easy for your entire team of medical professionals to use. Modio Health OneView pulls data from public services and primary source verification to collect provider details like education, license numbers, DEA, NPI, and more, helping you to stay compliant. OurRecords is a cloud-based credentialing and compliance management solution that allows businesses to store, manage, and enable access to verified credentials and records. The software manages data for a business’ team members as well as vendors and partners, all in one centralized location. Supplier and vendor records like W9s, state registration, and other compliance documents can be automated through OurRecords. The system can be customized by groups, each with unique requirements and credentialing objectives. MD-Staff, the healthcare credentialing software by Applied Statistics & Management, makes everything from daily tasks to logging CME (Continuing Medical Education) hours easier for medical professionals. The software offers the ability to store nearly any piece of provider information. Batches of data, like checklists, alarms, and customized workflows can be developed for individual providers. The reporting system of the tool offers an expansive library of built-in reports, including a list of expiration dates for license, insurance, board certification, and reappointment information. Kareo focuses specifically on the credentialing process for independent medical practices. The system is designed to handle a multitude of tasks from writing notes and prescriptions to supporting your in-house billing process, and offers enhanced EHR (electronic health records) functionality. The software also can support your insurance billing system, and even helps with marketing to promote your practice online and make it easier to find. Newport Credentialing has credentialing management software that can make onboarding for the healthcare industry quick and easy. The platform offers analytics via real-time dashboards and KPIs to get a big-picture view of the credentialing lifecycle. The software is designed to assist credentialing experts by maximizing their time and working on enrollments with the highest financial impact. Credential Agent stores your team’s credentialing information in an easy-to-see format and helps you keep employee or vendor credentials up to date. You can create a customized schedule that reminds you when it’s time to renew a certain credential, and receive an automated email, 90, 60, 30, or even one day prior to the expiration. These alerts can be sent directly to the employee, human resources manager, and anyone else relevant to the process. You can also run reports ahead of time to see what certifications will expire soon, and take action accordingly. IntelliCred from the IntelliSoftGroup is dedicated to being an easy-to-implement software credentialing system, and help you manage primary source verification and credentialing. The software group offers access to data consultants who help in the migration process for clients moving from one platform to IntelliCred. With the platform you can gather, store, and access the data necessary to maintain accreditation. The system can manage workflow actions and provider data for multiple facilities and units, even if the credentialing and verification regulations may differ. Silversheet provides one-step verifications for medical licenses and certifications. It helps you automate tasks with reminders, maintain a compliant facility, and centralize credentialing management in the cloud, allowing your facilities to go paperless. The company offers technical support via phone, email, and live chat with a representative who works with you one-on-one until your issue is resolved. symplr offers a suite of credentialing software for many different aspects of medical credentialing, whether for vendors or providers. The symplyr software streamlines the complex processes associated with privileging, credentialing, and payor enrollment. It helps with general credentialing, visitor management, exclusion screening, and more. The software can be a big help for any medical credentialing software needs. Here at CABEM, we believe that all organizations have unique needs that change over time. We have created a credentialing and competency management software that can work out of the box or be customized with different modules to fit your always evolving business needs. The Competency Manager is a credentialing management system that allows you to track credentials, train employees, and reduce risk across the organization. With the platform you can eliminate spreadsheets and filing cabinets with document libraries to store employee certifications, credentials, CMEs and any other records for current and past years. Save time by setting up automatic notifications for any certification expirations or necessary renewals. The system has permission-based portals for vendors as well, so they have access to see their own credentials but block them from seeing other important information. If you think the Competency Manager can help solve any of your needs, we’d love to show you a demo of the product. Credentialing management software can help organizations simplify the process of credentialing and remaining compliant. Whether it’s with automated reminders, at a glance dashboards, and document management to store certifications. Going paperless and switching to a cloud-based credentialing system can help save organizations time, money, and headache. There are many options out there available to solve these needs, and we hope this article helps you choose the best solution for your organization.